Many time going to police to report your lost smartphone are always very tedious and the chance of getting it back also very narrow. Today you are to learn how to find your lost phone without going to make any report at the police station or whatever. There is one more thing you can do on both your Android as well as iOS devices which might help you getting back or at least safeguard your data though is not 100% certain. Both iOS and Android have a service which lets you track or lock your smartphone. If you are on Android, you should install ‘Android Device Manager’ and if you are on iOS, you can get Find my iPhone. Android can be a lot more secure than you think and Android Device Manager is probably the best service for this task. The service has been there on the platform for quite some time now and not a lot of us know actually know about the functionality it offers. To start with, you need to be connected to the Internet and have Android Device Manager installed on your device. Post that, link the service with one of your Google Accounts and the app will then show you all the devices connected to the selected Google services. After this, the app will automatically show the current location of your device, only if it’s connected to the internet and linked to your Google account. You can simply make your phone ring if you think that your smartphone is lying somewhere around the house. If not, you can set up ‘Lock and Erase’ feature which will let you lock or erase your smartphone, in case you lose it in public. If you don’t have PC nearby, you can hop into your friend’s Android device and log in with your Google Account. This method can come in really handy if the thief hasn’t disconnected your smartphone from the internet and has also failed to remove your Google Account. However, if he does manage to do it, you are out of luck and the only option you have then reach out to Police. While Android Device Manager does the job on an Android device, Find My iPhone does exactly the same thing on an iOS device, prominently on an iPhone. Interestingly you don’t necessarily need ‘Find My iPhone’ app activated on your device to find your iPhone which is an added advantage in this case. In other words, Find My iPhone works over the cloud and you just need to login to your Apple ID via browser or otherwise an app on another Apple device. 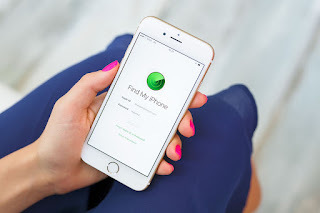 Open the browser, type in icloud.com and log in with your Apple ID after which you will find an option called ‘Find iPhone’ on your main screen. Navigate to the option and select the device to locate. Once located, you then get three options namely - Play Sound, Lost Mode and Erase iPad. Play Sound option will make your Apple device ring which is ideal if you misplaced it at your home or workplace. Activating Lost Mode will lock your Apple device and display an optional phone number to which one can call if he/she finds the device. Lastly, the Erase Mode will wipe all your data from the device if you think it has gone into wrong hands. Similar to Android, but if your data or Wi-Fi is disable or disconnected then it reduce the chance of tracking your device, keep your phone safe from wrong hand. However, activating the lock mode will safeguard your data and you can then ask Apple to locate the next time it goes online. In conclusion, Try and install the application to your phone in order to track your phone whenever is falls into wrong hand or when another person is using your data behind your back.